For strange one-day-only engagements, a few Cinemark theaters across the country have been playing a “restored” version of The Godfather Part II (1974). This is a follow-up to the same remarketing of the first film, The Godfather (1972), and Cinemark is proud (if premature) about this “Fortieth Anniversary Edition.” One reason for barely noticing the celebration is that the lucky theatres are so rare. Another is that the Godfather films have not disappeared. They are on television on some channel nearly every week, just because audiences love to see them over and over again. The two films are a modern classic, and a wry model for male behavior in so many businesses. So what does this “restoration” mean? Cinemark, the third largest movie exhibitor in this country, operating out of Plano, Texas, are happy to share the good news with us. A team “worked arduously on the film for over a year going through the original prints, re-release prints and negatives, shot by shot, foot by foot, frame by frame and even sprocket hole by sprocket hole.” That last is a dainty touch, aglow with nostalgia for the days of celluloid. The team involved Paramount (the studio that made the two movies), Francis Ford Coppola (who directed them), Gordon Willis (their cinematographer), and Robert Harris, who has done good work on movie restoration in the past—on Lawrence of Arabia and Vertigo, among others. It’s a tempting scene: Those diligent elves toiling for so long, one sprocket hole at a time, on the “meticulous” work of restoration. But Cinemark do not actually claim restored material never seen before, or damaged or faded film brought back to a state Gordon Willis would cherish; and no one wants the soundtrack any different from the way it was when the original film-makers signed off on it. After all, these are films set in the ’40s and ’50s. Great care was taken to recreate the look of those times, so why not let the sound stay 40 years old? The two Godfather films are magnificent, troubling and unforgettable. They are displays of craftsmanship—not just from Willis, but from Dean Tavoularis (design), Walter Murch (sound), Fred Roos (casting), Nino Rota (music), Anna Hill Johnstone (costumes), and so many others. Nor are the films simply a modern classic: They address businesslike wickedness in our world. Story and acting keep the films alive, but it’s the subject matter, too, the content. In the same way, Citizen Kane has lasted not just for its cinematic originality, but because of its portrait of a man who had everything and was a loser, and for the way it explores power in America and in the ego. The important things in a work of art seldom need restoring. At which point, you may recall the daring of Gordon Willis and Coppola making this one of the most shadowy of color films. 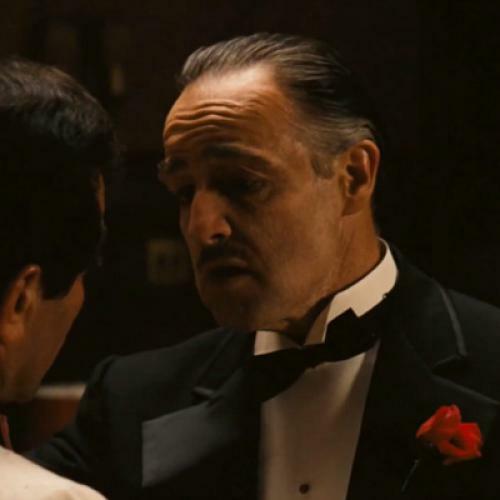 The Godfather was, for a moment, the most successful film ever at the box office. And now it is not exactly a film, but something fit for plush seating and Doremi servers. No, I haven’t seen this version, but I have seen enough digital projection in “complete entertainment environments” to be wary of the technical coldness of the show, and an end to that feeling of light falling on skin—photography, where appearance has burned into silver salts. But I’ll go, because I reckon to see The Godfather and Part II once a year. Yes, they are two films, and when the first picture was made the second was not really foreseen. Yet the second part came soon afterwards, from the same team of filmmakers, and an urge to complete and clarify the story. In the late ’70s, NBC played a clever amalgamation of the two films into one (and that did include material never seen before). We have reason and right to regard the two as one work. That’s how we feel a family resemblance between Marlon Brando and Robert De Niro, with De Niro, as the younger Vito, showing the flicker of the older man’s mannerisms. I stress the unity of the two films because later this year the British film magazine Sight & Sound will have its once-a-decade poll of film critics to find the ten best films ever made. It’s a game, of course, yet the poll has become a cultural standard because Citizen Kane has won five times now since 1962 and must be considered favorite to win again. Fair enough, if that’s what people think, but maybe it leaves cinema looking a little passé if our dominant film is 71 years old. Has nothing come along as great since then, not even with all the technical plushness? But the editor of Sight & Sound, Nick James, has advised the electorate that every vote must go to an individual film. You can pick The Godfather and Part II but not as the two halves of one work. I regret that because I think it misses a quality in the work, and diminishes the chances of the total Godfather being voted best film—I’ll guess it’s the most likely threat to Kane. There was another Godfather film, Part III, in 1990, with Coppola, Willis, and many of the same people. Yet we concede that it was not the conclusion of a trilogy in the true sense. It had a Michael seeking redemption when we felt he would be pledged to darker glory. It seemed made in another mood, going to the Vatican when it might have been wiser to explore Washington D.C., the real fountainhead of criminal legitimization, and a world that would preach plush seats and “state-of-the art.” What’s lasting in The Godfather and most disturbing is its cool assessment of how crime has become not just organized but part of our code, and how gracefully it renders that mayhem so we long to be Corleones.